Blicavs and Henry ran new Australians through football skills. GEELONG has hosted its fifth Welcome to Geelong event which aims to support and encourage Geelong’s newest Australians to enjoy the game of football. The event also provides an opportunity to connect with other Australians through the feeling of belonging to a club. 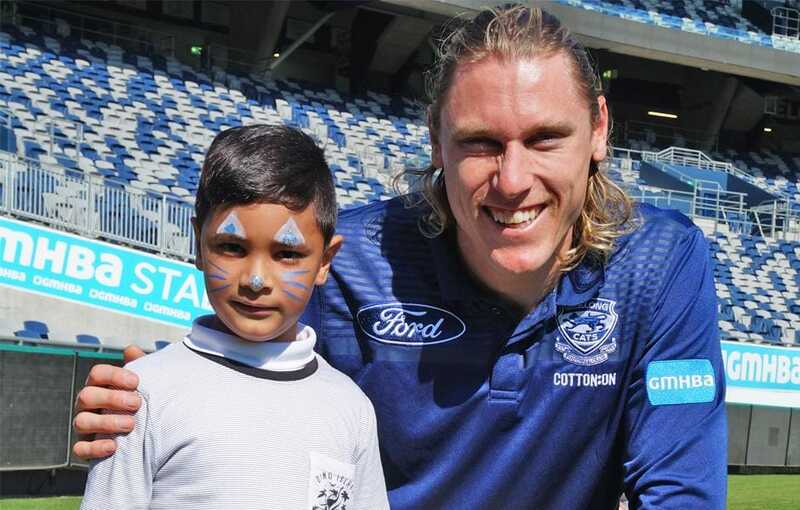 Over 120 people who have recently relocated to Geelong experienced a traditional Welcome to Country before running onto GMHBA Stadium through a personalised banner for a morning of football skills and fun with Jack Henry and Mark Blicavs. The day was topped off with an Aussie Fest, as the new Australians learned chants from the Cats cheersquad and filled their bags with giveaways, before walking away with new friendships and the feeling of belonging. Diversitat, Viva Energy, AFL Barwon and SEDA were all crucial for assisting in making the day a huge success.